Get yourself ready for a real northern (UK) scene video starring some of the North’s most highly regarded rippers as Adam Todhunter’s Coast to Coast is made up of footage spanning across the gritty northern land and his travels further afield. Todhunter may be a name you know from the recently released Supertoxic video, ‘We’re Working On It‘ but this production sees full parts from a variety of skaters, including three friends montages which take this video to an explosive 50 minutes of mind bending, non-stop skateboarding. It kicks off with a rousing intro sequence, showing many spine tingling slams and slow-mo steez, exposing the viewer to only a margin of what is to come. Sun-tangled chimes fill the air and first in frame is Graham Anderson flowing his way through the streets. This part is shared with Rory Muirhead, both skaters complimenting each others style as they carve with nimble feet through many tight spots that others may disregard completely. Rory finishes off this part with a pristine wallie over a gap and into the street below. The first of three friends montages commence with Josh Cobbin cruising with a pleasing bag of tricks including: a bs flip, clearing cobbles and a hefty gap with a big flip – all executed beautifully. Rob Mckinney then enter the fray with a humongous nose rag at Berlin’s famous Alexanderplatz banks, alongside Robert Sanderson and Daniel Le Maty whose lines through some rough wasteland terrain are notable. Danny Abel then demonstrates some smooth late shuv action whilst Dale Starkie stomps down some tricky manoeuvres before Lewis Johnson ollies over everything in sight. Ph: Mani Haddon with a fs tailslide. Next to step into the spotlight is Lancaster’s Joey Hurst, who is no stranger to a manual pad; filling it with personality as he performs bewildering variations displaying a impressively composed manner. A highlight from this section is a backside flip over a planter. Joey flips the board catching and spinning around at the last moment, making it look simple whilst traveling at speed. This flows through to a shared part showcasing three skaters. Leading the way is Phil Steavenson bumping his way over railings and lipsliding over gaps and through hedges. Lloyd Hodgson bombs on to your screen, opening strong. He slaps out an extended no-comply over a grass gap, rolling away effortlessly and making it look like child’s play. The flowing nature of Lloyd’s style and his apparent east coast influence is captured well throughout this section; whilst he seems as though he is coasting comfortably, in reality he’s probably fighting the need for his wheels to bite into the ground. One trick that gave me the compelling urge to go and skate was when he slappied up a ledge into a nose slide on the one above it, popping clean back over to flat. Something that I’ll never be able to comprehend. Stepping up to this standard is Thomas Miller with his similarly smooth style, cutting his way up the brickwork as he wallrides into a nose manual down the bank below, not something I saw coming at all. Dan Hallam shows skill with his long lines and, by the looks of things, his ability to 360 flip out of most grinds with ease. Blink and you’ll miss that flip! Dylan Sewell displays long grinds and longer lines. Dylan pushes the limits with a noseslide of momentous proportions too – over a shrubbery shaded gap and exiting with a 360 shuv to seal the deal and firecrackers an 8 stair. The crackle as the board quivers down each step will fill you with an ecstatic warmth. Someone’s got to film the filmer, right? Of course they do. Adam Todhunter is as strong a character on the board as he is behind a lens and he serves up the goodness before the second of 3 montage parts. Unwrapping itself with Danny Moore hauling himself over a hip height handrail and Lloyd McLeggon, one of Manchester’s most progressive skaters, with mental manny action and a stupidly high fs noseslide that would put us all to shame. Matthew Smith skims over jersey barriers and Krishna Muthurangl, Aiden Smith, Conor Charleson and Sean Barnes show a wide variety of skill and style, nonetheless showing how fun these four wheels can be. Johnny Haynes bombs banks, power sliding his wheels into squares followed by Fraser Irvine, whose feet can’t keep still, constantly readjusting for the next trick as soon as the board is under his feet. Helder Lima slides into a laid back line ahead of Jake Veitch and Reese Singleton, who kill it with their clips and are only a small sample of the home grown talent showcased within this video. Sprays of light divagate their way through the screen, the beat drops and Dan Main smiths into the shot. Bringing the hype from the very first clip as he does a three-piece line featuring a backside flip to switch manual. Dan’s part will definitely make you want to indulge yourself in his laid-back style as he makes delicate manual variations look simple. Intertwined within the precarious manoeuvres are the clips we all undoubtedly love, equally as much, such as carving through cobbled streets and ripping walls as his wheels rebound off them. So British. Harry Veitch and Connor North are both on their way to becoming well known names within the British scene and share the next montage. Harry has pulled through, blowing up the most awkward of spots with raw enthusiasm. Meanwhile, Connor can be seen charging the streets with flamboyant lines and long slides. Both lads have a clearly distinguished style, definitely two to keep your eyes on. Oh, spoiler alert… Harry has a close call with death in the final clip. Ph: Ross Zajac gap to noseblunt. We enter the final montage section with more cram packed four-wheeled goodness than the previous two. Myles Rushforth slashes over a few lambent ledges, not messing around with the quick fire lines featuring the standard DIY pole jam. Making a drive-by appearance, James Headford feebles fluently. This leads into Paul Regan’s pristine pop that nearly knocks himself out with his own knees. Josh Bentley has a few clips unearthed within this montage too. Snapping a no comply down a set is no problem. Sean Tracy gets on that night time mission thing, rolling worry free through the streets leading to Adam Thurtle who power slides across streets and rams off of every angle possible. Ben Armson and Lewis Elleden join the mix right before Charlie Munro gets hot, hot, hot; speed and power seem to be this man’s forte. Charlie’s team mate Mark Radden doubles up in Berlin with a hip-height crooked grind, knees tucked tightly to his chest. Brandon Justice hops from footpath to footpath, tweaking his nose right the way out. Little Saul Crumlish backside boneless’ a quarter about five times his height. So much so, that it gave me a chill. Sam Pendlebury offers a monster ollie from flat to flat. Ben Larth jams off a broken bollard into the street followed by a steep five-o fakie on a curbside wall. Similarly Calum Adams opens his clips with a wallride 180 out and a front blunt up and into a tight brick banked quarter. Will Sheerin then closes this powerful montage sequence, nollie flipping freely down a four block. You have to see it. Ross Zajac went to the zoo to open his cameo with penguins and giraffes, reminding you street skating is never short of strange happenings. Karma skateboards rider Ross has definitely been working hard with this offering of big gaps and quick-fire clips, this is shown when he fires a fifty down somebody’s front steps. Highlight from the section include a fakie full cab over a bin launching him into the street. Ross flows incessantly throughout, showing he can skate an obstacle in any way. Whether it is backside flipping a set or a wallride down the side, he’s got it. His laid back attitude makes his style massively addictive too, flipping or doing a 270 out of anything although it was a complete afterthought. Descent and Story Clothing ripper Will Creswick builds up for something big as he storms the penultimate part. This Newcastle local has a ferocious style that comes alive in his night time missions to perfect his no comply combinations. As well as the one-foot action there is plenty of quick-fire tricks too, juggling his feet in-between each movement. Will’s gaps to lipslides got me psyched in this part. Nothing out of the ordinary – until he bonks the trick into a nosegrind within a blink of an eye. His quick footed flair is well on point. Right before the credits roll, Mani Haddon takes the light, blowing it out in style. Mani’s innate excitement to skate radiates from this part as he bangs out clips in quick succession. Seeking the crustiest northern grit to destroy seems to be his intention, as he Switch Bs 360’s over a cobbled street gap. Mani and his catalogue of tricks delve deeply into this one and come out with some true gems before waves roll over his final piece, which will surely send you into a head spin. 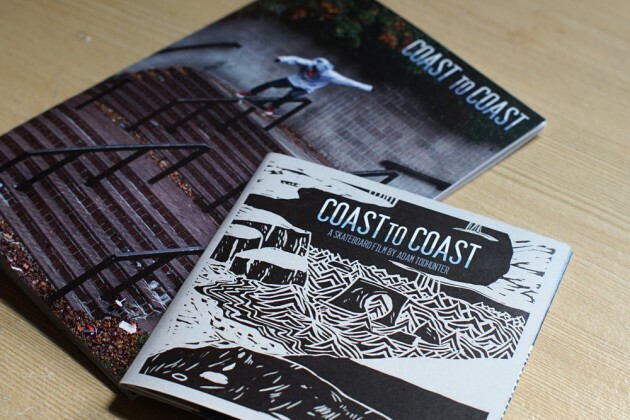 With Coast to Coast being a project spanning over two years, it’s amazing to watch these talented skaters and their tricks transform as the film progresses. 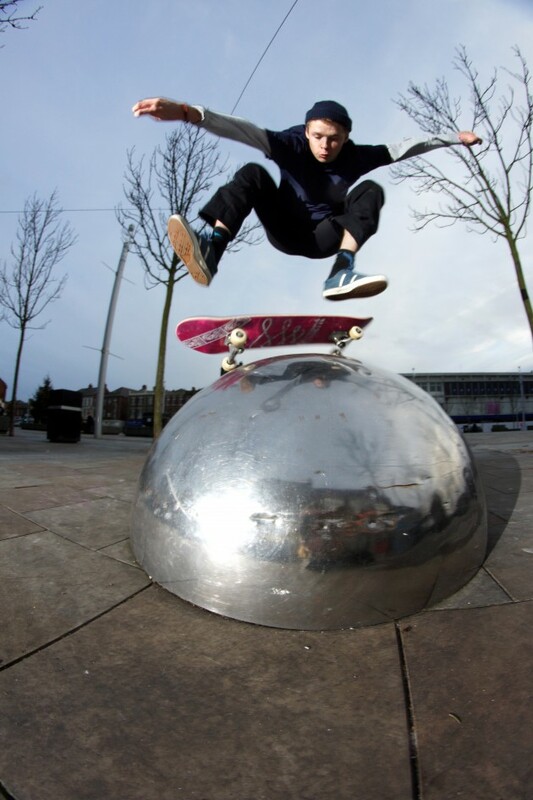 Adam encapsulates the individual styles of each skater perfectly bringing their personalities into view, making this a must-watch British scene video and a vital addition to your DVD collection. Support true skateboarding and check out Adam’s webstore where you can buy the DVD as well as a zine documenting the filming process. Enjoy some of Mani Haddon’s offcuts.